The Hi Vis Reflector cap is one of our most sought after clothing items, perfectly suited for promotional uses while at the same time, provides protection for regulative safety on the roads and streets. It is a perfect promotional item if you are a biking organization, or a land development or construction team who is looking to get your logo embroidered on promotional items. 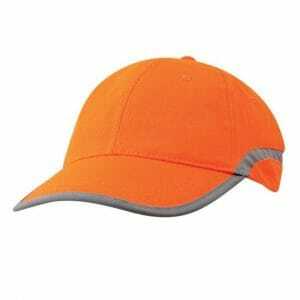 A perfect blend of form and function, the Ezycaps Hi Vis Reflector cap offers style, comfort, and road safety. You’ll have the confidence you need wearing one of these caps with a reflective strip around the front and sides, ensuring safe biking. The cap’s fluorescent feature makes sure that the visibility stays the same, day or night. The sun’s ultraviolet rays increase daytime visibility, while the passing car’s headlights light up the cap during night rides. Amusingly enough, the fluorescent effect is much stronger in poor light conditions, so when you are riding your bike during the fog or dusk, have no fear. It’s fluorescent during the day and reflective in the night. During those long night rides, proper equipment is required as passing cars illuminate the reflective areas of the cap and instantly warns the drivers about any present bikers on the road. One can never be too careful. Wearing one of our Ezycaps High Visibility Reflector caps means high quality and safety. Daylight is an important factor as well. Our high quality caps can really help out during the day, just as much as it’s effective during those tricky nocturnal rides. Foggy weather, rainy forecasts, and those grey autumn afternoons must not be underestimated. Always remember to wear a fluorescent material on yourselves. On those problematic weathers it’s imperative that one responsible man wears a fluorescent material on himself, for the safety of pedestrians and drivers alike. The quality reflective material works instantly, and makes sure the drivers see you on time, guaranteeing absolute safety. It can save lives. The Ezycap Hi-Vis Reflector Cap is made with a lightweight weave, has embroidered eyelets, and is equipped with green anti-glare fabric under the peak. It’s unique, casual style suits just about anybody and its hi-vis polyester fabric with a pre-curved peak ensures absolute comfort. It also offers high quality hi-vis reflective attributes which signals coming passersby. The reflective strip is along the peak edges and side panels, while the Velcro touch fastener makes sure that stability and comfort is at its finest. One of the most important features of the Ezycaps Hi Vis Reflector is the option to stitch any logo you’d like. Be it a company logo, corporate or business, or even your own personal idea, we deliver nothing but high-quality embroidery. The Hi Vis Reflector Work Cap can be embroidered with your very own corporate logo, absolutely great for biking and civil work organizations. Here at Ezycaps, we promote quality, comfort, and most importantly – safety, at all times. Always remember to wear your protective and reflective material while on the road. The Ezycaps Hi-Vis Safety Cap has you covered. There are many accidents related to improper road equipment and misinformation, so please be safe.